I took a break from making swap cards for the upcoming Stampin' Up! Onstage in Atlanta to make this fairly easy card. This adorable little Snowman is from the "Christmas Magic" stamp set. This vintage-looking stamp set is fast becoming one of my favorites! 1. Cut your card base in Whisper White (5 1/2" x 8 1/2", scored at 4 1/4" and set aside. 2. Cut a piece of Pool Party cardstock 4" x 5 1/4". 3. Cut a piece of Whisper White cardstock 3 3/4" x 5". 4. Cut 5 strips of Whisper White approximately 3 3/4" x 2". Tear the top edge of 4 strips and ink with Pool Party ink. Stamp the sentiment in Basic Black ink on the bottom right of one of the torn pieces. That will be your bottom snow layer. Ink the torn edges with Pool Party ink. 5. Starting with the card front piece of Whisper White (3 3/4" x 5"), using a dauber, blend the top 1/3 of the card with Pool Party and Soft Sky inks. 6. Stamp the trees in Basic Black ink. 7. 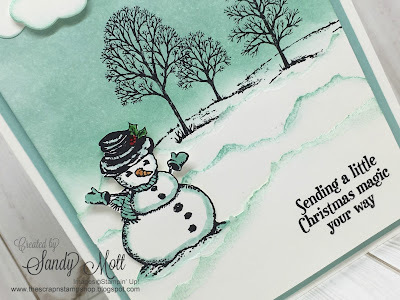 Stamp the Snowman on the leftover strip of Whisper White and color as I indicated above. Fussy cut. 8. Add snow strips to the card front. 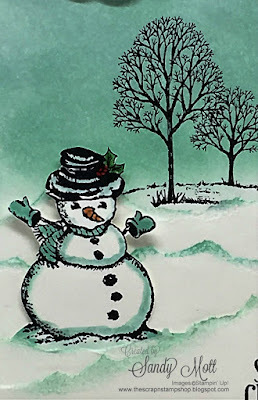 Tuck the snowman into a snow drift. 9. Mount onto the 4" x 5 1/4" piece of Pool Party. 10. 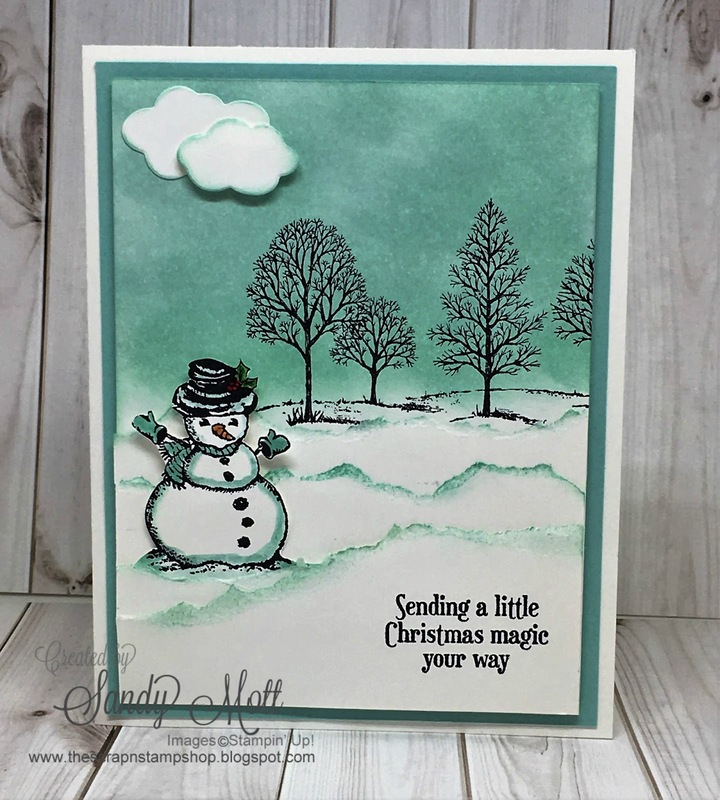 Mount onto card base and add inside sentiment of your choice. I hope you enjoyed today's post - I would love to hear from you! 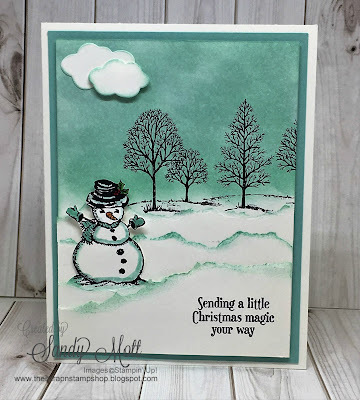 Stay tuned for the Creative Design Team Blog Hop on Thursday. I'll be on my way to the Atlanta, Georgia, Stampin' Up! Onstage, so be sure to LIKE my Facebook page HERE to get all the latest news on the upcoming Spring Catalog. And while you're at it, you can follow me on Pinterest HERE. Have you seen these new dies? They are available November 1 in my online store! Order these dies and take advantage of my Customer Rewards Program! See the tab above! November's host code is: SPP97VVZ. Beautiful card! Love the combination of stamp sets. and the colours are just perfect! Another absolutely awesome card & will have to give it a try when mu house & stamp space are cleaned!! !